In between cooking rice and prepping dinner this morning I made some play dough. But I didn’t really forget to add colour, I made plain white play dough because I had another idea for adding colour to this play dough, as well as a fun way to make impressions. 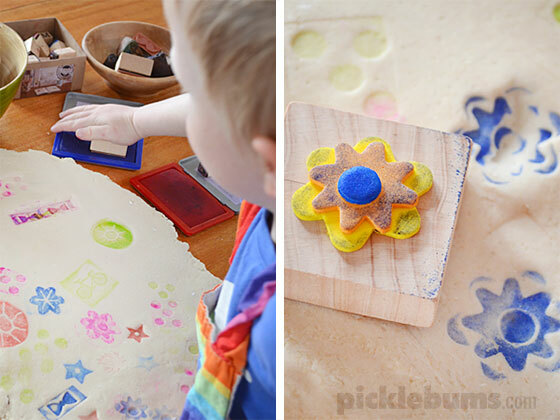 A nice plain, flat, piece of rolled out dough is the perfect surface for some play dough stamping! 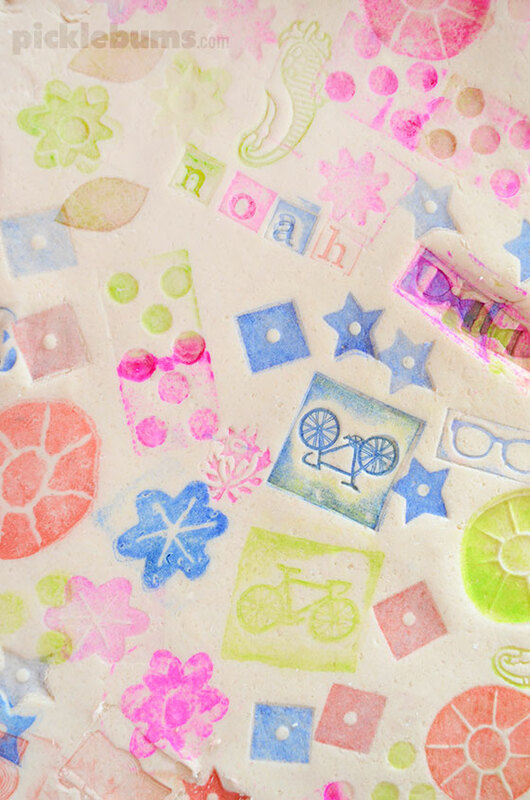 While the dough cooled Noah and I dug out some of our stamps and stamp pads, and we also made a few new stamps. 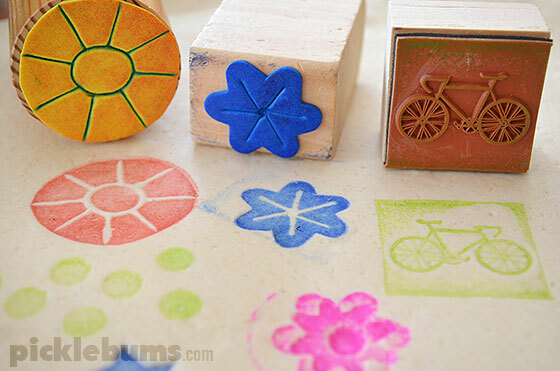 Using craft foam, or foam stickers is the easiest way ever to make stamps. 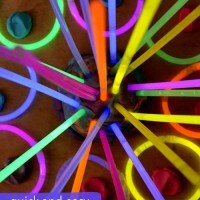 Simply glue or stick the foam onto some wood blocks, or use bottle caps, and you are ready to go. 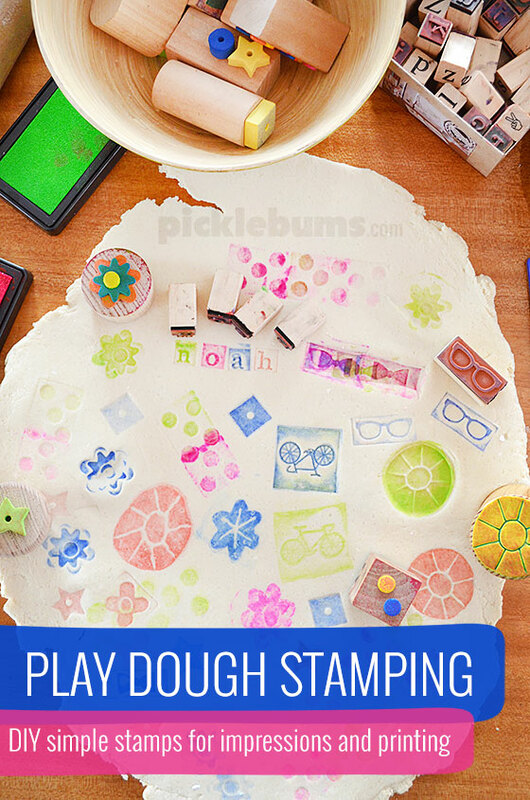 Because you can stamp an impression into play dough as well as an image, you can make the stamps extra fun by adding different layers to them. Build the stamps up by adding more foam, or make impressions into the foam simply by pressing firmly as you draw with a pen. We started by simply exploring the impressions the stamps made into the dough. What happens if you press softy? What about if you press hard? Can you make a pattern or a picture? Then we turned our slab of play dough over and added colours to our stamps! We used our regular ink pads that we use with paper, but when the big kids got home from school they had fun colouring the surface of the stamps with markers and then stamping them. ONce you’ve filled up one slab of play dough with colours and impressions, just squish it into a ball and roll it out again! I wonder what else we could use in the dough to make impressions and stamp colours? Do you love play dough as much as we do? 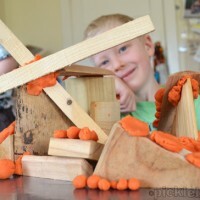 Try some of our other easy and fun play dough ideas! 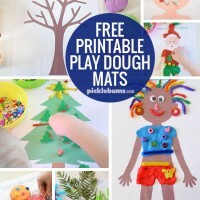 Find all our free printable play dough mats here. This is brilliant! 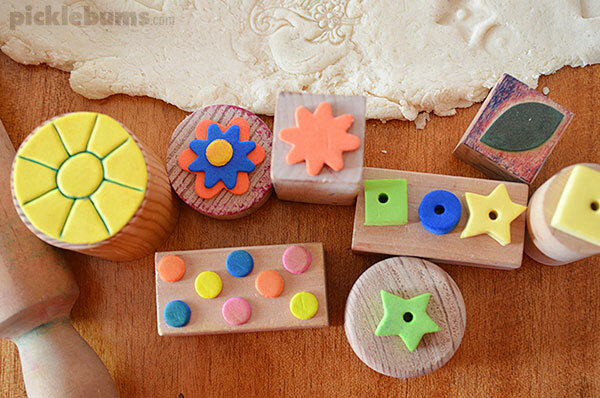 My kids love play dough and stamping– the combination will certainly provide lots of entertainment (just what we need with our summer break starting here)! Thanks and I can’t wait to give your dough recipe a try… the microwave sounds very appealing! This is a fabulous idea. I have a stovetop playdough recipe but would love to try a microwave version. Thanks for the inspiration Kate! A good way to keep kids indoors during this summer. 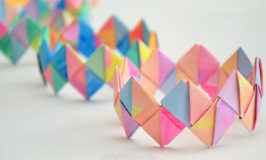 These are so awesome! Thank you so much for your creativity you openly share! 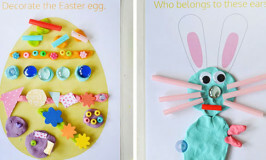 An idea of more playdough placemat ideas would be a Mr. or Mrs. potato head mat to decorate the face. 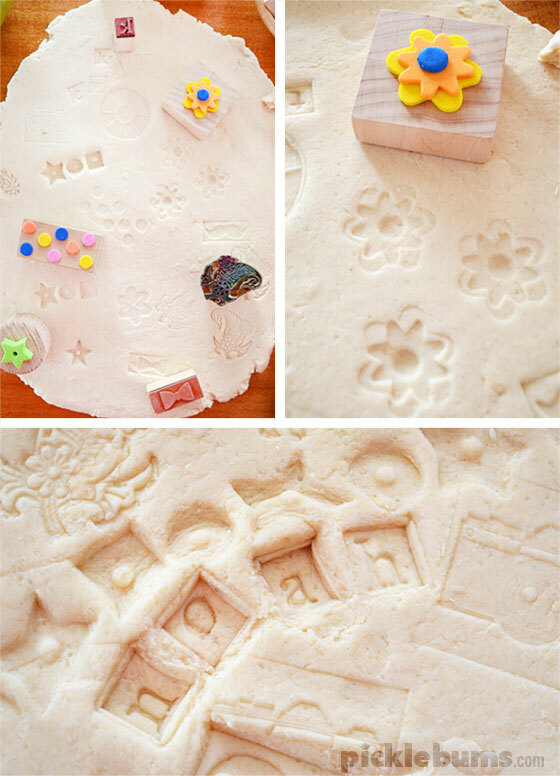 Home » Play Dough Stamping.